STRYKER (AUS) (Bay 2006-Stud 2011). 2 wins at 1200m, 1350m, BTC Classic, Gr.3. Sire of 137 rnrs, 64 wnrs, inc. SW Rangipo (New Zealand Derby, Gr.1), Strykum, SP Labdien, She is Stryking, Miss Nymeria, Miss Loren and of Mr Markou, Perpetual Crisis, Andrioli, Metier, Sonesta, Fast Stryke, Persian Princess, She Ra, Splendid Stryker, Pinstryke, Fleeting Stryke, Stryking Stunnah, Baggio, Conspicuous Maid, Roseberry Street, Seattle Stryker, etc. Mosque (g. by Dubai Destination). 4 wins to 1100m, SAJC Adelaide Galvanising H., 2d SAJC SA Sprint Series Final H., Anthony Catford's Birthday H., Boags Draught H.
Who You Know (g. by Host). 2 wins at 1050m, 1200m, SAJC Drink Driving? Grow Up H., 2d SAJC Drink Driving? Grow Up H., Farmers Union Iced Coffee H., Need it Done? Jim's the One H., 3d SAJC William Hill H., Thomas Farms H.
Hanukkah Gold. 2 wins at 1400m, 1500m in 2016-17, SAJC Adelaide Galvanising H.
Strobes. 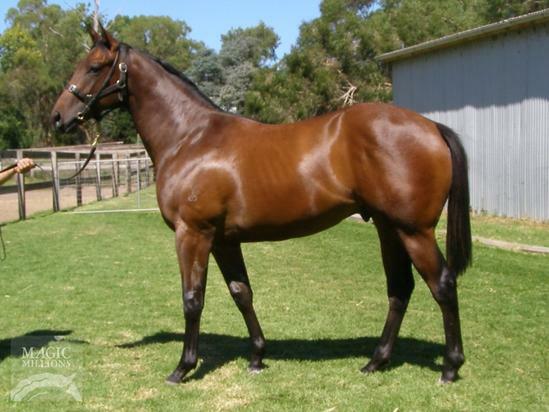 Winner at 1400m, 2d SAJC Sportingbet H.
La Pieta (Redoute's Choice). 3 wins-1 at 2-at 1200m, 1400m, A$170,490, ATC Tab.com.au H., Blackwoods Apex Tools H., 2d GCTC Silk Stocking H., L, ATC Thoroughbred Rehabilitation Trust H., Testa Rossa at Vinery H., 3d Gosford RC Belle of the Turf S., Gr.3, ATC Drummond Golf H., Mitsubishi Mirage Mile H., MVRC Melbourne Signage Concepts H.
BLESSUM (Umatilla). 7 wins-1 at 2-to 1400m, A$455,250, VRC Standish H., Gr.3, MRC Manfred Welter H., Members Raceday at Classic Caulfield H., VRC Australian Lamb Company H., SAJC Christmas Flying 2YO H., 2d VRC Standish H., Gr.3, Century S., L, Bob Hoysted H., L, MRC Evan Evans Cup H., 3d AJC Galaxy H., Gr.1, VRC Salinger S., Gr.1, SAJC Jansz S., Gr.3, MRC WJ Adams S., L, Evan Evans Cup, 4th MRC Victoria H., Gr.3, SAJC Smoke-Free SA S., Gr.3, VRC Bob Hoysted H., L, MRC JRA Doveton S., L, SAJC RA Lee S., L.
Maduro. 13 wins-1 at 2-to 1400m, A$325,710, SAJC Country Challenge Series Final, Silks Brasserie Flying H., Distinctive Homes H., Scott Group of Companies Flying H., Scott Group Of Companies H., Come to Allan Scott Park H., Allan Scott Park H., Trims H., Centro Properties Group H., Scott Group of Companies H., Gold Ace at Glenrae Stud 2YO H., Honda H., 2d MRC Premium Class Package H., 4th SAJC Fulham Park P., L.
ANGEL OF MERCY (Hussonet). 6 wins from 1300m to 1600m, A$531,575, BRC Lord Mayor's Cup, Gr.3, ATC James HB Carr S., L, BRC Members' H., L, Northam Cup, L, ATC Schweppes P., BRC Channel Seven H., 2d Qld Tatt's RC Tattersall's Tiara, Gr.1, WATC Konica Minolta H., Wyong RC Magic Millions Wyong 3YO S., 3d ATC Emancipation S., Gr.2, VRC Vanity S., Gr.3, 4th VRC Herald Sun S., Gr.3, Bunbury S., L.
Pray for Time. 2 wins at 1100m, 1200m, SAJC AV Jennings H., Hard Spun H., 2d SAJC Spartan Electrical H., 3d SAJC Distinctive Homes H., Neil Sachse Foundation H., Schweppes H.
REGENT ISSUE (New Regent). 7 wins-3 at 2-to 1200m, A$86,050, SAJC Oaklands P., L, Harpagus H., Just a Dash H., Belcunda H., Ellers Holden Nova H., Centaurea H., 3d SAJC Da Costa P., L.
Heroic Lord (Lord Dudley). 5 wins at 1050m, 1200m, 3d SAJC Oaklands P., L, Epsom H., Mary A Neate H., Progressive H.